Too many Nail Techs are missing out on the incredible benefits of working with UV Gel, favouring old skool methods of liquid and powder acrylic and failing to best meet the needs of their clients. Capture new clients and delight existing clients by taking another look at the advantages of being trained and confident to offer UV Gel Nail Extension services. Our blog this week addresses many of the problems some Nail Techs have encountered and overcoming these to boost your confidence within this incredible, flexible and multi-use product. There are many kinds of Gel and it is easy to get weighed down in the terminology. Gels vary in viscosity (how thick or runny the gel is) which is due to their differing chemical molecular structure and this dictates the strength the product will provide when cured to the nails. Choosing the correct treatment gel type for the individual client’s nail type will help with durability of the nail service results and so it is important to avoid taking a ‘one size fits all approach’ to your UV Gel Nail extension products and services as you grow in nail experience. This knowledge is essential to allow confidence in the products you choose to use for your nail services. When overlaying the natural nails where you just want some additional strength but retain natural flexibility to the nails, you would work with a soft gel. Soft gels have a higher molecular weight with an elongated molecular structure which leave space between molecules. This usually means they have a thinner, runnier viscosity. Their molecular structure allows solvents such as acetone to penetrate and break down the product so these are often known as ‘soak off gels’ as removal is with acetone. Commonly used to give colour and some additional strength to natural nails (without giving any additional length), they are considered gel polish alternatives or for overlay when growing out natural nails. Beyond soak-off (soft) gels, there are several other types of gel found in any savvy Nail Tech’s kit. When creating nail extensions, you will normally use a harder type of gel often known as builder gel. Builder gels have a tighter molecular structure with a lower molecular weight and so usually are thicker in viscosity. They are more resistant to solvents such as acetone and so must be filed or buffed off when removed. Builder (and hard) gels are usually applied in layers, building up to create strength and shape as required for the client. Builder gel is only suitable for strong, hard surfaces such as healthy natural nails or over abs plastic tip application as it cures into a much more rigid product with minimal flexibility. Hard gels are a compromise between builder gels and soft gels, their tighter molecular structure makes them suited to most nail types and they are usually the best type of gel for use when sculpting. Sculpting nail extensions (which is where the nail technician uses a nail form to build the nail extension onto the natural nail without use of false tips), means a nail enhancement can be created on any nail type even those where application of a tip such as bitten, damaged or misshapen natural nails is not recommended or otherwise problematic. When sculpting nail extensions, there are often specific hard gels designed to give best result with forms (rather than over tips. Such ‘hard’ gels, which differ from builder gels in that generally they are less rigid when cured and slightly thinner in viscosity; are generally more flexible, adhere better to the natural nail surface and so flex better with the natural nail when under pressure making breakage or lifting less likely. Consider coloured camouflage gel products to help hide imperfections and extend the nail bed for best results. False tip application is usually best for persistent nail biters or previous biters where nail plate growth has shrunk back from ends of fingers significantly followed by overlay with a strong builder gel and use of a bonder to enhance adhesion over damaged or uneven areas of the nail plate. 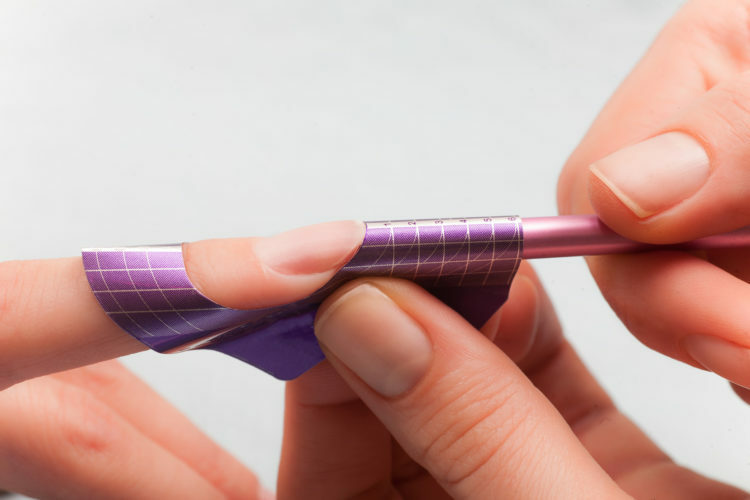 Take extra care to create the perfect apex, consider extending the apex backwards from the stress point slightly towards the cuticle area to avoid lifting of the entire extension if nibbled by clients without thinking and avoid leaving nail extensions too long for nail biters, with maintenance intervals kept to every 14 – 21 days maximum. When applying gel over peeling natural nails, the risk is that the gel will peel off with the natural nail layers. Avoid this with correct preparation, use a 240 grit file to gently buff traces of peeling or flaking before gel application. A thin layer of a soft gel prior to overlay the natural nails before applying the builder or hard gel will help enhance adhesion of the nail extension and avoid lifting. Keep nail extensions short and be sure to shape nail extensions in keeping with the client’s natural nail shape to avoid lifting as nails grow out. Ideal when working with clients with healthy nails that just want a little extra strength when growing out the natural length. Soft (soak-off) gels and the newer one-phase gels are ideal for this kind of application as they give strength with just a couple of layers but retain natural nail flexibility to avoid breakage and splits. Nails which have an unusual shape or uneven nail surface due to previous damage or illness, take care to adapt the nail form to ensure a perfect fit and sculpting application. Self-levelling hard or builder gels are ideal as they give a smoother finish requiring less filing and camouflage gels are great for hiding imperfections on the nail plate. A bonder or primer product will also boost adhesion of the gel to uneven surfaces. Care will need to be taken during removal due to the unevenness sometimes seen in misshapen nails when filing off hard/builder gel to avoid filing into the nail plate and causing thinning or further damage to the nail structure. For this reason, clients should be advised that you will leave a thin layer of the gel remaining when removing nail extensions completely and allow this to grow out naturally rather than attempt to remove all gel from the nail plate. When working with clients who have nails prone to lifting or naturally soft nail plates, one good tip is to use more than one type of gel. When working to create the extension from the stress area to the free edge, use a strong builder gel and then working from stress point backwards to the cuticle area, use a more flexible hard gel. This will help the nail extensions when growing out, giving more flexibility to the nail overall as the stress point shifts with growth and helping to prevent lifting from near the cuticle area. When creating nail extensions for clients who love having very long extensions applied, firstly ensure they are suitable for such length. Long nail extensions are usually only recommended for clients with strong, healthy natural nails. To prevent breakage, you might like to work with a hard gel which combines fibreglass pieces to give added strength. Excited to get tailoring UV Gel treatments for your clients needs? Not sure where to start? You might like to consider our UV Gel Nail Extensions training course or the follow-on course in Stilettos & Sculpting. Looking to begin working in a salon? Our Qualification training routes are just what you need. Need more advice, then give us a call on Freephone 0800 999 2277!